Izzy and his friend J. soaked up today's late afternoon sun in Liberty State Park, where they became far to familiar with one especially enormous mud puddle. Izzy was mud-spattered in the front and soaked in back, covered in brown, slimy muck. 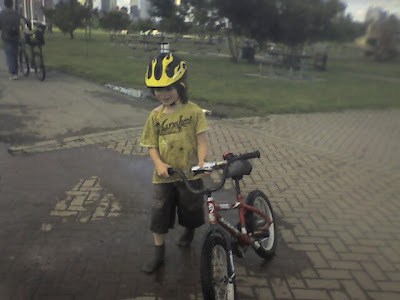 He biked and his friend scooted, over and over again through brown icky waters. I tried not to cringe at the thought of putting their mud-covered bodies into my friend's car and let them have fun. Boys do love a muddy time after all. Besides, as my friend G. put so well, "Better mud than videos." The reaction of various on-lookers ranged from bemusement to disgust. One young woman announced loudly, "Imagine if my child (future I am guessing) ever did that. I would have a heart attack!" Comments like those only spurred Izzy on to further muddy fun. When the boys took a brief break from their mud-induced euphoria, I became the filling station as they stuffed themselves with popcorn, bananas, crackers, raisins and dried apricots. J. prepared raisin sandwiches, stuffing them between crackers. Every time I turned around, a little muddied hand was finding its way into my snack bag. Eventually I shooed them away and back to their muddy games. When it was time to leave, we had to strip them down to their undies and place them on plastic bags in the car. As we drove home they began plotting their next muddy adventure and we began figuring out a strategy to deal with it better ( towels, crocs and a change of clothing). I had a dream that you, Alex, Izzy, and a couple of other people that I've never seen before came into the pizza place I work at right before we were about to close at 11:30. So I served you pizza even though I should have left awhile ago, and after you ate it you were just like "nobody likes their pizza cold, Jessica". Your dream is my reality. Ask Lynn about our pizza excursion to Freehold, NJ a few years ago.